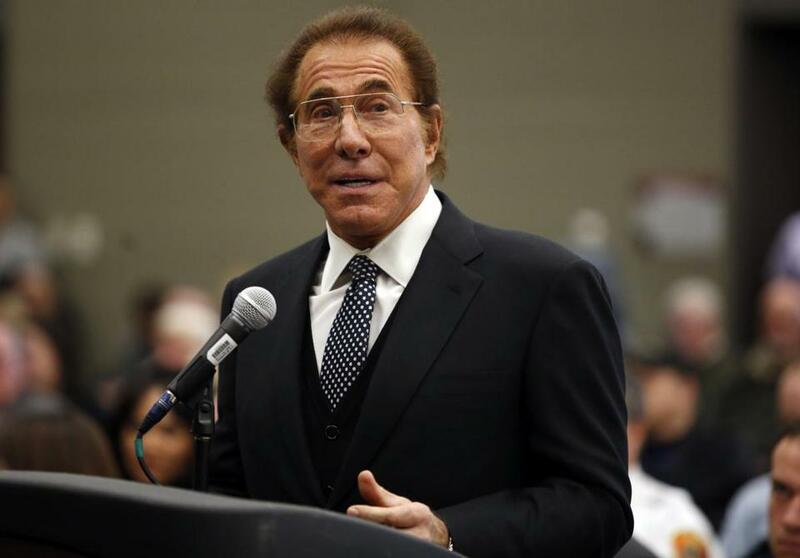 Steve Wynn testified before the state gambling commission in January. Wynn Resorts, the casino company vying for the Greater Boston gambling license, donated $200,000 last winter to the Republican Governors Association, the same organization that is now playing a key role in boosting Charlie Baker’s run for governor. The state’s gambling law prohibits applicants for casino licenses from donating, directly or indirectly, money or in-kind contributions to “any group, political party, committee, or association organized in support” of a Massachusetts candidate. The association is a major funder of a television ad that is currently airing in the Boston market supporting Baker’s candidacy. But whether the statute applies to Wynn’s donations is unclear. There is no evidence Wynn’s firm earmarked its donation for Baker, and the association says it does not accept earmarked funds. It also says it has a segregated account for donations from the gambling industry, and does not distribute those funds in states where prohibitions like the one in Massachusetts exist. But Common Cause of Massachusetts, which was instrumental in putting the provision into the 2011 casino licensing law, said the donations violate “the spirit if not the letter” of the prohibition on camp aign donations. Wynn spokesman Michael Weaver adamantly rejected any notion that the contributions bumped against the statute. He said the governors association is very aware of the restriction on its use of donations from gaming interests. The gambling firm, which has supported the Republican Governors Association in the past, made the contribution on Dec. 13, 2013, the same day that company founder Steve Wynn was hosting an association fund-raising event at his home in Sun Valley, Idaho. Also, listed on the same date is a $6,069 “in-kind” contribution from Wynn personally related to the event at his home. “Consequently, it is clear that Wynn Las Vegas LLC’s contribution was not made, or used, in conjunction with the RGA’s contribution to Commonwealth Future,’’ Michael G. Adams, the association’s general counsel, wrote to the general counsel of Wynn Resorts. Wynn, his wife, and his company have been heavy donors to the Republican Governors Association and other GOP groups, including the Republican National Committee, in recent years. In 2011, The Wynns and their firm gave $350,000 to the association. The couple also donated $32,400 each to the RNC. “This has not been a new interest,’’ Weaver said of the Wynns’ support of the GOP. The issue of the Wynn donation and whether it conforms with the law banning gaming industry contributions could be made more complex by the role that former governor William F. Weld is playing as a close confidant and adviser to Baker in the gubernatorial campaign. Baker served in Weld’s Cabinet in the 1990s. Weld now works with ML Strategies, a government relations consulting and lobbying firm in Boston that is representing Wynn Resorts in its bid for a casino license. Three days after the donations, Weld accompanied Wynn to an appearance before the state gambling commission, where commissioners reviewed the results of a state background check on the company and ruled that Wynn had passed. Weld said he was not aware of the donations at the time they were given and that he had only heard of them when the Globe brought them to his attention this week. “I have not discussed the donation with anyone in the Wynn organization or the Baker campaign,’’ he said, adding that he did not know the law banning gambling donations well enough to comment. Under state law, the commission is the arbiter of any potential violations of the political donations ban and would have the discretion to impose a penalty. Exactly what penalties are available is not spelled out in the law. A commission spokesman declined to comment on the donation. Commonwealth Future, an independent political action committee, launched a substantial ad campaign this week to promote Baker’s candidacy, highlighting Baker’s campaign themes and pointing to his role in saving Harvard Pilgrim Health Care from bankruptcy as its president and chief executive. It also highlights his close ties to Weld. The Republican Governors Assocation’s help in funding the ad campaign came to light because of a new law signed by Governor Deval Patrick last week that requires super PACs to list the five top donors. The exact amount given will be made public seven days after the expenditure. Wynn’s casino proposal is competing with a Mohegan Sun casino plan in Revere. The commission is expected to pick a winner in mid-September.